This is a story that speaks of love; a parent’s love for a daughter with Williams Syndrome, love from a life-changing vision therapist, Carmen, and love from me, the lucky Optometrist who treated this very special person. We all contributed and did our parts to making her life better. Elena came to our center 2 years ago, at age 10. She was unable to learn to read or write, so it was a nightmare for her to go to school every day. She was stressed and sad; very sad. Her visual attention was so poor that she could not even watch an entire movie. From the Optometric perspective, Elena has a significant amount of hyperopia (farsightedness), post-surgical residual strabismus, and visual abilities far below the level needed to achieve academically with very poor eye movement control and collapsed peripheral vision, so she read and worked at a very close distance as if she were looking through a tube. All visual perceptual abilities were far below her chronological age which affected her reading ability and her ability to express ideas in written form. 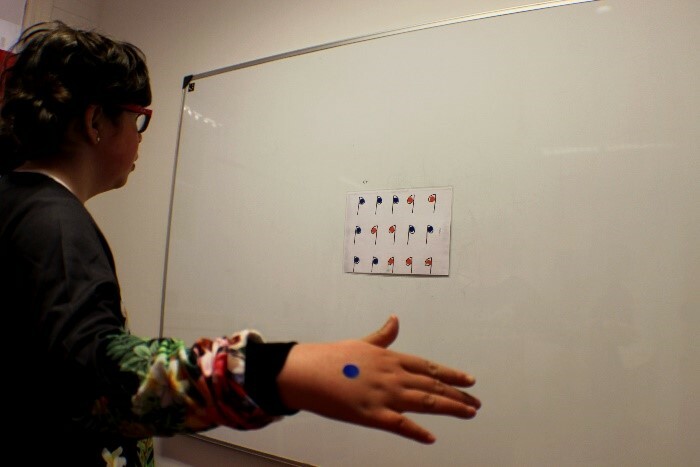 In addition, Elena had very poor motor coordination which reduced her ability to judge and move through space. Because of her strabismus, she did not see in 3 D, although cosmetically she looked pretty good. Our main goal for treatment was not to treat the strabismus, as she was neurologically well-adapted, her visual acuity was good and I felt it was too complicated to focus on the strabismus. Elena worked for 2 years in our office, with treatment one day each week, and 20 minutes of daily home VT activities. Elena, and her mother, Puri formed a good team, never missing a single VT session and working consistently on the home VT as well. I have the great fortune to have an incredible therapy team in my Optometry Center in Albacete, and each and every one of them, the Office Manager, the 3 Optometrists, and Carmen our Vision Therapist has a gift with children having special needs. In our Center everyone works based on excellence and love which produced the incredible results in Elena. We have also had great mentors, our dear Robert and Linda Sanet. As I said in a post I wrote some time ago, it’s us, the professionals, who often put limits on what is possible for patients with special needs. Yet it’s incredible how much we can help these patients improve their lives using the principles of Behavioral Optometry and Vision Therapy, if we learn to adapt our methods to their needs rather than the other way around. We help these patients, but in reality they help us more. They, and their parents, give us life lessons with their courage, perseverance, love and faith. Through their example they show us that even though things are not always easy, you should never give up. This case study is dedicated to them. Working with Elena and her mother, Puri has been one of the best experiences in my life, both on a personal and professional level. Elena and Puri are examples of dedication and constancy, and they transmit beautiful joy and a love to all who know them. During the past 2 years Elena has improved dramatically in all aspects: gross and fine motor control, visual and visual perceptual abilities, visual attention, and other abilities that have helped her to enjoy a much better quality of life, and above all to gain self-confidence, seeing that she, like other children, is capable of achieving. The change in Elena’s handwriting was spectacular and reading and attention improved dramatically as well. But most importantly today Elena is a HAPPY girl; happy with herself and happy with her life. At 3 years of age Elena was diagnosed with Williams-Beuren Syndrome caused by a deletion of genes from chromosome 7, which Elena’s affects neurodevelopment in language, motor coordination, and vision. After her diagnosis we tried many different therapies to improve her development, but Elena still had many learning problems, little self-confidence, and low self-esteem. Elena has been wearing glasses since she was 8 months old for a significant amount of farsightedness and she had unsuccessful strabismus surgery (cosmetic improvement only). So, we decided to try Vision Therapy to see if we improve her vision and performance in life. When Elena was evaluated by Pilar Vergara, I remember leaving the office thinking I was the worst mother in the world, since Elena still had so many vision problems, more than I ever could have imagined. From the first day I entered Pilar’s Center in Albacete, I felt I was in the best hands, and we left ourselves in those hands…MY WILLIAM´S FLOWER. We attended Vision Therapy every week.And, in addition we did Syntonic Therapy, and had assignments to do at home every day. 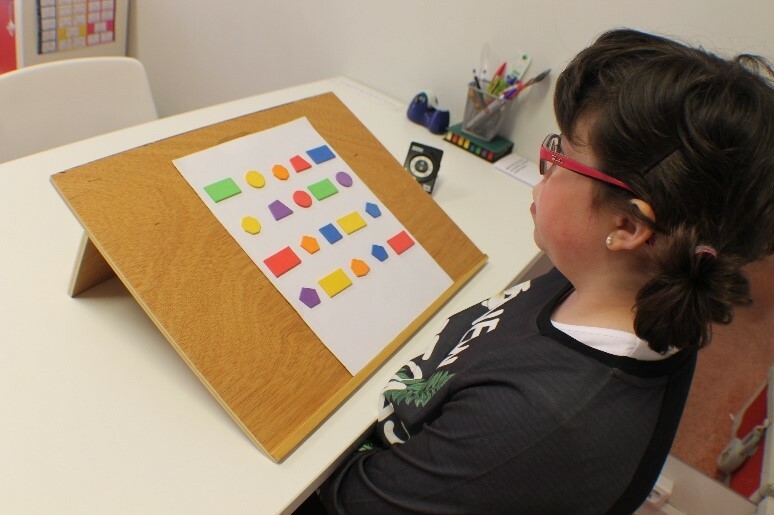 As the therapy progressed Elena began improving in many aspects, reading, writing, walking down steps, fine motor skills, coordination … ..and with these improvements her self-esteem and confidence in herself grew and grew. The Vision Therapy was challenging because it requires a lot of constancy and daily work. But it is definitely worth it because of the incredible results. Elena has completed two years of vision therapy. We are now taking a break, but for sure we will resume again soon. I would like to thank the great team of optometrists and vision therapists, especially Mari Carmen, for the sensitivity and professionalism that characterizes her to work with “special” children. And of course PILAR …… thank you very much, for giving us the opportunity to help our child to improve so much and to move forward and upward in our lives. THANK YOU!